Hunter Douglas offers three different types of plantation shutters featuring different materials to suit any home or situation. You might be looking for a classic hardwood plantation shutter, or a hybrid plantation style shutter that gives you the beautiful look of hardwood in a durable window treatment that can stand up to high traffic and playing children. You might be looking for something different, like a shutter made of modern materials that can stand up to extreme conditions. Whatever your needs are, Hunter Douglas has a solution. Heritance® is the line of classic hardwood plantation shutters offered by Hunter Douglas. These naturally beautiful shutters are crafted using real wood, with Truemill® dovetail construction to create a strong and durable product that will last for decades. Heritance® shutters can be customized to fit any window or door and can be stained or painted to match any existing woodwork or decor. For ease of maintenance, these hardwood shutters are available with Integra™finish, which is a multi-coat finish that adds durability and a high luster while requiring minimal cleaning. Heritance® is also available in a special Handcrafted Series. This series allows you to choose from one of six artisan techniques that enhance the color and character of the natural wood, including Rustic and Textured, Heirloom Distressed, Classic Distressed, Glazed, or Glazed and Burnished. All wood used to create Heritance® plantation shutters comes from responsible and sustainable sources, and for every Heritance® shutter purchased, Hunter Douglas will make a donation to the Arbor Day Foundation® to continue preservation of trees and rainforests. NewStyle® is a value-priced hybrid option from Hunter Douglas that beautifully blends the natural look of real wood with modern man-made materials to create a strong and durable shutter that looks great in any room. Like Heritance® shutters, NewStyle® shutters are constructed using Truemill® dovetail construction for durability and longevity. Available with UltraGrain™ which is an optional grain-like finish that replicates the natural look of real wood. To make life easier, NewStyle® is available with FineTech® finish. This coating gives the shutter a micro-smooth satin finish that makes clean up simple with. Just wipe them off with a dry, soft cloth. 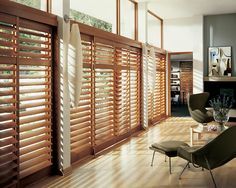 This resilient shutter is a great option for high traffic areas of your home. Hunter Douglas’ Palm Beach™ shutters are constructed using a UV-resistant Polysatin™ compound, designed to stand up to extreme heat and moisture. The major stress points are reinforced with interior aluminum bracing and resign blocks for added stability and durability. These shutters are guaranteed to never warp, crack, peel, or discolor, making them a great option for kitchens and bathrooms. Clean up is easy; just use mild soap and water. Palm Beach™ shutters are available with the patented DuraLux™ Finish, giving them the look of a finely painted shutter. They are scratch and dent resistant and will never need sanding or repainting. 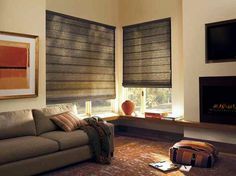 If you are considering Hunter Douglas shutters for your home, contact the friendly and knowledgeable professionals at Quality Window Treatments. 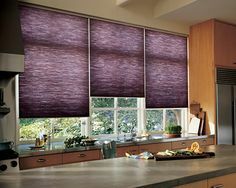 We are your local Hunter Douglas dealer in Granger, IN and proudly serve Greater Michiana, including South Bend, Mishawaka, Elkhart, Goshen, Granger, and the surrounding areas. Contact us today for a free in-home consultation and see how plantation shutters can work for you.